A. Fibre glass lined m. S rectangular open channel of length 3. 3-6m with steadying section of size 300x300x1000mm having baffles and channel section of size 0. 2x0. 15m fitted with two adjustable gates . (1) At the middle and the other at the discharge end of the channal and arranged for demonstration of hydraulic jump. A screw jackarrangement is provided for varying the forword slope of the channal upto 1 in 25 with an indicator with two rails at the top for movement of the hook gauge with trolley, all mounted on a sturdy iron stand, for conducting experiments. b. Two hook gauges mounted on movable troll’s one on either size of the middle gate with provision for locking the trolly’s at any position. c. Removable venturiflume withprovision for mounting in the channel. d. Fibre glass lined m. S. Measuring tank of suitable capacity to measure the discharge water from the unit, arrangement with bypass arrangement having a partition wall and change over hopper and provided with gauge glass scale arrangement and a drain valve. e. Fibre glass lined m. S. Sump to store sufficient water for independent circulation through the unit for experimentation and arranged within the floor space of the main unit. 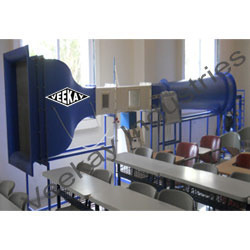 Looking for Subsonic Wind Tunnel ?